Watch the full episode of The Lost Diary of Dr. Livingstone and examine new forensic techniques being used to study Dr. Livingstone’s unpublished field diary, which reveals he was witness to the brutal massacre of slaves at the hands of their traders. The writings in this diary suggest Livingstone was far different from the legend that surrounds him. Dr David Livingstone, the British explorer who became a Hollywood legend. Livingstone filled in the map of Africa. We have never seen a terrestrial explorer like him and likely never will again. He’s kind of the ultimate Victorian macho man. His dispatches from a horrifying massacre shocked the world and led to the abolishment of slavery. The massacre he witnessed in an African village saw slavery abolished and changed the course of history. But was Livingstone the Victorian hero he’s made out to be? His original field diary contains a secret – hidden until now. That was the first time that anyone had seen it in 140 years. This is the story of The Lost Diary of Dr Livingstone. Over 150 years ago, Livingstone ventured into a land that westerners called the ‘dark’ heart of Africa. In 3 major expeditions, this Christian missionary and fearless pioneer covered 47,000 km – a distance greater than the circumference of the earth. He hoped to discover rivers that could become major commercial trade routes. He was convinced Christianity would follow trade, and put a stop to the slavery he despised. In Britain and the US, slave trading had long been abolished. But, in East and Central Africa it was rife. Now, a team of experts led by Adrian Wisnicki of Nebraska University is doing groundbreaking work into an event Livingstone witnessed that ultimately led to the end of the African slave trade. I wanted to find out what had happened during one of the most important moments of Livingstone’s final expedition. The National Library of Scotland holds the single largest collection of Livingstone materials in the world. Wisnicki is interested in Livingstone’s reports of slave trading in the centre of the continent….and wants to know more. Livingstone had been away from home for about six years. It was at least two years since the last letter from him had reached the outside world. In 1865, he set off in search of the source of one of the greatest rivers on Earth - the river Nile. But – by 1871 - to the American and British public – Livingstone was all but lost. His audience was desperate for news…and a US newspaper journalist set out to track him down. “I’m thankful I’m here to welcome you mister…..? Stanley arrived back with an exclusive - news of the elusive Livingstone. And with hot property – Livingstone's latest journal. Within its pages was a shocking story. It describes how slave traders massacred innocent villagers in Nyangwe, a village deep in central Africa. So one day Livingstone is leaving the market and just as he is doing so three traders come into the market place with guns. At that moment, an altercation breaks out. The traders begin firing into the crowd. People start running in every which direction some are jumping into the river the traders keep shooting and shooting. It’s a horrific massacre; the traders kill some 3 or 400 men women and children in the span of a few hours. …provoked the British government to step in and stop the slave trade. Allowing European powers to colonize the continent. But Livingstone’s journal carried back by Stanley might not reveal the whole story. When Wisnicki looked deeper into the events at Nyangwe, he found something curious: there were several accounts of the massacre. And they were all different. In the journals published after Livingstone’s death and edited by his friend Horace Waller there is one variation. In the books produced by Stanley based on his discussion with Livingstone there is a second variation and then in Livingstone’s letters there is a third variation. So, I started thinking to myself, which of these texts is much closer to the truth, to the reality as Livingstone actually experienced it. Livingstone had a particular way of recording his experiences. First, he jotted short notes into a daily field diary. Then at a later date, he'd write these notes up and create a journal. This would be the basis for his published books. So, to discover what really happened in Nyangwe, Wisnicki needed to go all the way back to Livingstone’s original field diary, written during the massacre. The question was - where was the field diary that corresponded to the massacre? At the National Library of Scotland, it was nowhere to be found. But just 80 km away near Glasgow, is the David Livingstone Centre. This was once a mill, as a child Livingstone and his family lived and worked here. Dr Neil Wilson is the great great grandson of David Livingstone. Well, this is a gold medal, presented to my Great, Great Grandfather, by the Royal Geographical Society. It says on it ... Terras Reclusas – to lands unknown, or yet to be discovered. ...Livingstone's first hand account of the massacre at Nyangwe. This is Livingstone’s private diary, he kept this with him until he died and it was never intended for anyone but Livingstone himself. For the last 140 years no-one has been able to read it. The diary up until now has kept its secrets. But, this is no regular diary. Livingstone’s handwriting was scrawled on old bits of newspaper. The actual physical condition of the pages says as much as what Livingstone has written down. and was forced to improvise. Short on ink, he used berry juice instead. You can see how it’s faded……so it’s completely illegible, it’s a total mishmash of text. Livingstone was the last person able to read these words. For Wisnicki it seemed like a dead end. The truth about what happened at Nyangwe may remain locked in these pages. A state of the art technology first invented by NASA for unpicking the secrets of the solar system could hold the key. Multi spectral imaging could be the only way to recover Livingstone's handwriting from the diary pages. At Megavision Studios in Santa Barbara, California, a pioneering American team has developed cutting edge equipment that can see the invisible. KB: Here it is this area here. AW: Because there is multiple layers here and I’m really curious as to what lies at the bottom layer and I think among the pages this probably the page that has the biggest chunk missing. Ken Boydston is the chief camera engineer. These are very narrow band coloured LEDs with high power so we can illuminate large areas in a short period of time with bright brilliant clear and pure colour. To recover Livingstone’s faded diary entries, the team uses hi tech LED light panels to shine different colours or wavelengths of light onto the documents. The process we are using really is intended to see things that the human eye can see and see those things very very accurately and then beyond what the human eye can see, we have LED lights that not only shine in the visible range but also in the ultraviolet and the infrared. The team takes high-resolution black and white photographs under 12 separate wavelengths of light. And under each wavelength the diary page reacts differently. So when light is shined on a document, the document will absorb some of the wavelengths of light and others get reflected so a red piece of ink will reflect red light but it absorbs the other colours of light. The more light that is absorbed, the darker the handwriting appears. But, Livingstone’s words are still unreadable, buried in newspaper print. To discover the truth about what happened at Nyangwe, the team begins a scientific collaboration that will last for 6 months. By the time Livingstone is writing this field diary, he is out of funds and plagued by sickness. But he still pushes on to find the source of the Nile. On his first two expeditions, he had searched for a navigable highway into the interior – but failed. Aware it could be his last chance, he had to succeed this time. Desperate, Livingstone was forced to depend on the slave traders for supplies and protection. They were forging their way into the center of Africa on the hunt for ivory. Joanna Lewis of the London School of Economics has investigated African trading networks in the time of Livingstone. So what’s happening then, and in parts of Central Africa, is that Africans are getting sucked into this horrible vortex: ivory, guns, slavery. It’s a toxic mix. Ivory, in parts of Central Africa, is only 50 cents a pound – take it to the coast and it’s worth about 50….60 dollars, so ‘kerching’ !! The international ivory market was booming, and with it, the slave trade. The traders had a well-travelled route from the east coast, more than 900 miles into the interior. And Livingstone went with them. He shared their food; they even nursed him when he became sick. On the way, they stop at Casembe, Ujiji and Nyangwe. From these villages, traders exchange guns and cloth for ivory. They enslave African villagers to haul the ivory to the coast where it was shipped to Europe and America …..while the slaves were sent to plantations as far as Cuba and Brazil. I think he’s quite a tormented soul. He had to live with the fact that he had to work with Arab slavers - that they helped him move around. That he had to rely on slaves.... so he had to learn to compromise. Livingstone’s descriptions of slavery in Africa were brought vividly to life in Britain and America in magic lantern slide shows. This image is a particularly disturbing image actually, you can almost hear the screams...and this is a scene that Livingstone described quite a few times in his diaries, when he would come across, particularly women, who were too weak or ill to carry on would be left, tied to trees...and what’s particularly chilling about this of course is that on the hillside there you can see the hyenas coming in. So those people that are still alive at this point, knew that they would probably be eaten alive if they weren’t already dead. Hundreds of thousands of villagers were enslaved and forced to walk all the way to the east coast. Many died en route – some were flogged to death. Knowing the slave traders well, Livingstone tried to reason with them. The demand for slaves and ivory seemed unstoppable. He learned to live in this brutal environment, but in his reports home, he exposed the truth about the trade. Along with Livingstone’s descriptions, slide show audiences and church congregations were presented with some of the most brutal weapons of slavery used to capture villagers in Central Africa. A mask like this would tell the whole story [?]. speak volumes? This is most probably one of the most hideous objects I’ve ever seen, and touching and looking at it makes me feel quite sick. This would have been state of the art slave submission, hi tech stuff. Imagine this being put around your head. This would have gone into the mouth to stop the screaming. It’s very small, so it’s suggestive of something that was for a woman or um, a child. There’s no doubt about it, this would have caused tremendous pain. So it’s more of an instrument of torture, really. It's quite shocking. Africa was a million miles away, but if you passed round an object like this, that would help bring the horror right into the Victorian, chapel…the Victorian church hall. So it brought Africa right to the heart of Victorians. Livingstone first started to publicize the horrors of the slave trade almost 15 years earlier, when he became the first European to cross sub-Saharan Africa. His account of this first expedition, Missionary Travels in South Africa, catapulted him into the public eye. It was a best seller – and it turned Livingstone into an icon. It was like he had come back from the moon or he had come back from Mars and he had been hanging round with Martians. For them – that’s what it was like. He had mingled with cannibals. He had lived amongst the heathen and survived. Livingstone arrived in Africa as a missionary and a doctor. While his public saw him as a saint, the truth was, he struggled with missionary work. In 30 years in Africa, he made just one convert to Christianity. It was boring, it was just so unglamorous and he didn't enjoy it. ..He didn’t like the sedentary family life, he was not cut out to be a missionary whatsoever. The real Livingstone was driven and ambitious, convinced he could open up Central Africa to European commercial trade. And his accounts prove he was a cartographer of extraordinary skill. He charted large parts of the continent previously unseen by European eyes. Where there was once a blank space, he filled in the map of Africa. One of Livingstone’s most famous discoveries was the Victoria Falls on the Zambesi River. This is what Livingstone and his party saw almost 150 years ago in 1855. After months of trekking, it would have been an awe-inspiring sight. Explorer Russell Gammon has been following in the footsteps of Livingstone for 25 years - and has investigated his map-making techniques. Locals used to refer to this place as ‘Mosi-oa-Tunya’, which means the smoke that thunders – and you can see by looking behind the…the spray rising above the falls, and this is, is visible in the peak of the season up to 40 miles away and it really does look like a brush fire in the distance. Victorian explorers had no high tech equipment. 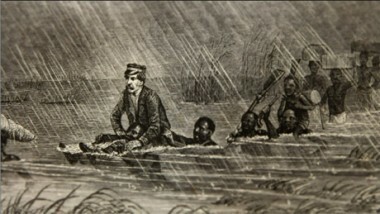 Livingstone and his party travelled the length of the Zambesi river on foot and by canoe. So what we are sitting in here is a traditional dug-out canoe or mokoro as it’s called in these parts, made out of a hollowed out tree trunk and it’s a very effective way to travel. It’s the way that Livingstone would have traversed most of these waterways. It’s obviously very buoyant and inherently not brilliantly stable but a bit like riding a horse. Once you get used to it, it’s fine. This is the island of Kalai. In his bid to map a navigable route through Africa Livingstone camped here on his way up river. He used a marine sextant to determine the island's longitude and latitude, and so his exact position on the earth. A sextant measures the angle of the sun above the horizon. By taking a measurement at the same time every day, Livingstone could determine how the angle had changed, and from this, work out how far he had travelled east or west. So what we want to do is raise the sextant up and first of all look for a horizon line, then we bring the arm forward like this and you can see the mirror angle changing and what I am seeing looking through here is it looks like the Sun is actually coming down until it settles on the horizon, which is roughly about there…and you read off here your degrees, minutes and seconds. So when we look at his record of the latitudes that he recorded, we can now measure them very accurately just using a hand held GPS. So according to him we were we were South 17, 51,54 and according to our GPS we are 17, 51.91 so he was pretty accurate in his measurements. That’s an error of just less than half a mile. Geographers at that time believed that most of the interior of Africa was a desert so the existence of these rivers alone was startling new information. But, for the lauded explorer Livingstone, the bubble was about to burst. The pocket map he drew on this first expedition appears to prove the Zambesi was the trade route he was searching for. He had accurately charted hundreds of miles of river, but made one fateful decision. This dotted line marks the short cut locals had earlier recommended he take around the Cabora Basa Gorge. In doing so, he missed a major obstacle. A series of rapids impossible to navigate by boat. It was a disastrous oversight, with fatal consequences. On a second trip financed by the British foreign office, he returned to the Zambesi to prove he could travel the length of the river by steam boat, opening up major trading opportunities. Livingstone was followed by a large party. But the rapids blocked their route. At the mercy of the extreme conditions, one by one, they died – including Livingstone’s wife Mary. When news of the men, women and children that had perished reached Britain, Livingstone got the blame. In three years they spent I think £100,000 of the British tax payers money, they didn’t make it more than 300 miles up the river…Livingstone arrived back in Britain at the end of that really his reputation severely tarnished by the failure of the Zambezi Expedition. So it was all round a bit of a catastrophe really. Livingstone was hit hard by the death of his wife. The trip also destroyed his credibility as an explorer - and brought him to the brink of financial ruin. In 1865, he returns to Africa – ‘the white man’s grave’ – a third time. It would be his last. For Livingstone, the 'dark continent' is unfinished business. There are many reasons for him to return: to atone for his wife’s death, to regain his credibility as an explorer and to fight slavery. His field diary pages could expose more about what drove Livingstone than ever before. Humid conditions in the forest, the harsh sunlight and the writing materials Livingstone used had a devastating effect on his last diary. Some of the most crucial parts of the massacre story are impossible to read. Imaging scientist Keith Knox was one of the first experts to analyse the pages. The newsprint just interferes with your ability to see the hand-writing, and, not only can we not see it, but it couldn’t be read 140 years ago when people first saw it. For every diary page, 12 black and white photographs are taken under—one for each of the separate wavelengths of light. What Keith finds gives him a glimmer of hope. Under the blue light, the ink is absorbing all the light and as a result it appears dark against the background of the newspaper. As we change the light and move it towards the green this ink starts to reflect a little more and it starts to have lower contrast and you can’t see it as well. As you get to the red it reflects a lot of light and it’s practically gone – and in the infrared which the eye can’t see but the camera can it’s gone completely. The handwritten ink is most reflective – so faint - under long, infrared wavelengths of light. As light of shorter and shorter wavelengths are shone on the document, the handwriting begins to absorb more and more...until finally - under the shortest wavelengths, blue light, the ink is most absorbent – and dark. The spectral images reveal the handwriting more clearly than ever before – but Keith still faces a major challenge. Livingstone's words are still completely hidden by visual ‘noise’: the newspaper print. The printed ink appears clear and black in every photograph. By using the infrared image that shows only the clean newsprint, he can make it disappear. So here’s an inverted image of the newsprint where places which were black are now white. Next, Keith adds the inverted newsprint to a page that had handwriting on it, and something extraordinary happens. When you do that the result is….just the handwriting, and it’s absolutely remarkable and when I first that – I just couldn’t believe what it was that, that happened with the writing just appeared, and it was easy and you could read it. This ingenious algorithm works not just on one page, but on all of them. So when the writing appeared on the screen, that was the first time that anyone had seen it in 140 years. Dr Livingstone was the last person to have read it – and that was truly an amazing feeling when I realised that happened. You can just look at it and read it – ...on the 28th, “Eight villages in flames, on the other side of the river”. ... catching slaves, or rather free people to be made into slaves. Now, the biggest challenge - analysis of the diary content - can begin. It will take almost a year to complete. Livingstone’s third expedition would make or break him. He had lost his wife and reputation. Now he is prepared to risk everything to find another route into the interior and the source of the Nile. But by 1871, his final mission is falling apart. The main reason – his failing health. While the traders and villagers are able to endure the harsh conditions, Livingstone is plagued by tropical diseases. Without his doctor’s training he would never have lived to tell the tale of the massacre. He is out of medicine and out of time. He seeks out the local witch doctor’s medicines and cures. It is the only way he will survive. This Zambian city is named after Livingstone. Today, in towns like this local herbalists still use the age-old traditions of witch doctors. Dr Lawrence Dritsas has been researching the diseases Livingstone encountered. Looking at a place like this – we’re looking back and seeing the kind of information he was getting when he was talking to African doctors, er, and learning about what they were using for fever, for diarrhea, for malaria and all these things. LD & Lady - Fine fine fine. LD - What kinds of medicines do you have here, what kind of diseases can you cure? Lady- Yeah, headache pains, diarrhea and diabetes. These are the same plants and roots Livingstone would have relied upon. LD- If I had chills and fever – what should I take? What do you have here for me? LD - Ok this is for fever, is it strong? Lady - Yeah it's strong. LD - It's nice....I guess there’s something in the tannins like a tea, there'll be some oils coming out of the wood and other things that would be drawn out by boiling......For how long should I be breathing this for? LD - Just twice? Ok, thank you. Livingstone did exactly the same thing, in fact at one point he talks about being ‘stewed in vapour and smoked like a red herring’ - when he had a really bad fever and he decided to try what the local doctor can do for him. Using a combination of his European medical training and the local African herbal remedies keeps Livingstone on his feet. Livingstone never wanted to denigrate African medicine – he wanted to see what they did, what was in it, what was in the plants they were using and see if they could actually be combined with Western medicine. Some of the drugs that they discovered, um, and some of the herbs that they used are actually still used today in Western medicine. On this final expedition, he suffers his most severe attack of one particularly deadly type of fever –malaria. 150 years ago, malaria was a mystery to doctors in Africa and the west. On earlier expeditions, when Livingstone travelled along these same river banks, he recorded suffering from malaria dozens of times. He needed an effective treatment. Livingstone was concerned about malaria because the instance of malaria really could affect the way his work could be done. It affected the way he could travel, you know, if he had to lie down and recover for a few days – this slowed him down. As he travels he makes a ground-breaking observation. He realises that mosquito ridden swamplands are malarious. Livingstone develops his own medicine and pioneers a systematic dosage which helps keep him alive. The main ingredient was quinine, found in the bark of the South American cinchona tree. What Livingstone discovered – was that quinine didn’t prevent malaria from occurring, it didn’t prevent his companions from getting fever, but what it did work as, was a cure. Using quinine and a laxative Livingstone creates a mixture he believed would clear the system of toxic fever. In order to make his Rouser pills, Livingstone combined quinine with some Calomel, which is mercurous chloride, er, which we would consider poisonous today. Also some ground up rhubarb root and some jalop,, with a bit of tincture of cardamom – and you can put it all in together into a pill and these came to be known as ‘Rousers’ because they got you back up – they roused you when a fever had put you down. In a high dosage, quinine stopped malarial parasites from multiplying inside the body. Branded back home as the ‘Livingstone Rouser’ –it was marketed and sold for forty years. It would protect British soldiers, colonialists and merchants from malaria and allow them to build the largest empire of the age. Towards the end of his third expedition he has run out of Rousers…and he is still no closer to finding the source of the Nile. Malnutrition has loosened some of the teeth in his gums – and he has no choice but to extract them himself. Consumed by his mission, he presses on - to the village of Nyangwe. Wisnicki analyses the hour-by-hour account of the massacre in the field diary alongside Livingstone's published account. And a very different picture of Livingstone begins to appear. As he stays in the village he inches closer and closer every day ...to the edge of a moral abyss, of a kind of moral darkness.....he turns to methods that are similar in their violence to those of the traders. Livingstone is waylaid in the slave trader village of Nyangwe for 6 months. He is almost broke and most of his followers have deserted him. He sends for new men, and 10 freed slaves, he calls his Banian servants, arrive. He’s still hunting for the source of the Nile, but it’s only possible with the cooperation of the slave traders. I think, on a scale of obsession with regard to finding the Nile – on a scale of 1 – 10, he was probably 12 at this point. And all the time…in Nyangwe, trouble is brewing. One of the most powerful slave traders of the region, Dugumbe, is in town. He discovers his most senior and trusted slave has been dealing - behind his back - with the local villagers. Unconcerned by Livingstone’s presence, he sends his gunmen to the market to teach the villagers a lesson. Livingstone was wandering in the market. It seemed to be the case that he enjoyed going to the market, there were lots of women and children, so its shopping day – lots of things to look at and to see. He sees Dugumbe's men - with guns. and he is a witness to this. This is certainly what er, Stanley, er, writes and very much presents Livingstone as having to look at this atrocity that was so unspeakable - Livingstone described it as being in hell…..this, er, horrendous event which he can do nothing about. In haste, hour by hour, Livingstone pours his account onto the newspaper pages of his field diary –later, he creates the cleaned up, edited version destined for publication. Now, the newly deciphered field diary pages bring to light for the first time, the private words of David Livingstone. The massacre had a huge impact on Livingstone’s personal feelings. He has lost the ability to function because of what he witnessed in the massacre. And, it’s the events that occur just before the massacre that really draw Wisnicki’s eye. These field diary pages expose Livingstone’s deepest anxieties. Livingstone was powerless to stop the massacre. But he was now so close to the traders that they didn’t even care he was witness to the slaughter. He had, until now, turned a blind eye to their immorality. The diary pages show the massacre makes him desperate to cover his tracks. In order to downplay some of the violence with which he has become associated, he also tried to downplay the violence of his followers. It’s no secret that Livingstone has great difficulty controlling his rebellious new Banian servants. But, what this diary page shows is that while at Nyangwe, these servants behave like criminals. When an ivory deal goes wrong in a nearby village, the traders beg Livingstone to send his Banian servants to the rescue, but he refuses. He writes ... “I refuse to send my slaves because they would only add to the confusion and murder, if they go anywhere I must go with them or murder is certain”. The Banians may once have been slaves, but as freed men, they are far from victims. The Banyan servants are former slaves but now they are liberated but they remain corrupt, they remain violent and dangerous. The fact that they can’t be changed, that their fundamental character remains the same is troubling for Livingstone as a committed abolitionist. So troubling, Livingstone removes the word ‘murder’ from the published version of events. He is editing his diary because in his obsessive quest to find the source of the Nile he’s strayed from his principles and he doesn’t want people at home to see that. And, there’s another passage in the field diary that exposes how far he has come to acting like the slave traders in the build-up to the massacre. To continue his journey, he needs a canoe. He tries to buy one from local villagers and traders - without success. Eventually, he does a deal with Local chieftain Kalenga. But Kalenga double crosses Livingstone. He takes his money but doesn’t deliver. The field diary pages show that now, Livingstone's anger begins to boil over. And he does something completely out of character. You can see an amazing change in the way that Livingstone decides to handle this situation. He writes...“Men off to force Kalenga to reason. If he refuses to refund, to bind and give him a flogging”. Is something missing in the block below? He sends his Banian servants – men he knows are capable of murder - to mete out rough justice. But the word flogging is completely erased from the published version of events. He is taking the original narrative and he is completely reconfiguring it, he is reconfiguring reality really. Livingstone has gone to the edge of an abyss...The massacre occurs and it forces him to confront the kind of person that he is starting to become and at that moment he turns back. For Livingstone it’s a moment of both triumph and failure. Failure because he turns back from the quest that he has set his heart on. Triumph because when push comes to shove he makes the right decision. Sickened by the violence he was powerless to stop, he could not bring himself to deal with the slave traders any more. Livingstone admits defeat. He gives up on his dream of finding the source of the Nile and of regaining his great reputation as an explorer. He retreats east to Ujiji, where he meets Stanley. When Stanley brings Livingstone's Public Journal home – it creates a press frenzy. This cleaned up version of events focuses attention not on Livingstone, but on his account of the horrifying massacre. When this story starts to circulate, it’s no longer an abstract issue – it is so real, it is so vivid, it is so graphic it is a game changer as far as actually getting government intervention on the ground. It gives the abolitionists the ammunition they need –and puts the slave trade on the front page of every major newspaper in the civilised world. Livingstone’s reputation soars. But he would never benefit. After Stanley left him in Africa, he died. His body was carried back to Britain by his African followers. The source of the Nile still a mystery. He was determined to do something about the slave trade. Coming back to Africa at the age of 55, it was very unlikely that he would survive to see his children but if that’s the price that he paid to see an end of the slave trade in Africa I think he would have considered that a bargain. Just one month after Livingstone's death, in June 1873, Britain signed a treaty with the Sultan of Zanzibar. It shut down the world's last open slave market and ended the East African commercial slave trade – once and for all. Over the course of 30 years of exploration, Livingstone traversed the territory of many tribal groups. The first European to document some of the world’s longest rivers and largest lakes. But, his legacy would be used as a tool for a new, aggressive kind of European imperialism. His discoveries in the name of science and humanity would become the highways for a new mission - to colonise a continent. And it would be called the ‘Scramble for Africa’. Digging out these forgotten diary pages began an incredible journey inside the mind of one of the 19th century’s greatest heroes. An explorer haunted by his obsessions, who craved personal glory, Livingstone was no saint. He never did find the source of the Nile. But - whatever his methods – he was successful in bringing an end to the slave trade, beginning a new era in history. this program was produced by Sky Vision and THIRTEEN, which are solely responsible for its content.